Tetrahydrozoline or tetryzoline is an alpha agonist (substances that help blood vessel constriction) found in certain eye drops and nasal solutions. Tetrahydrozoline Poisoning is the accidental or intentional intake of medication containing tetrahydrozoline. What are the Causes of Tetrahydrozoline Poisoning? What are the Signs and Symptoms of Tetrahydrozoline Poisoning? The signs and symptoms of Tetrahydrozoline Poisoning can vary from one individual to another. It may be mild in some and severe in others. Several systems of the body, such as the respiratory system, digestive system, nervous system, and ENT may be affected. How is First Aid administered for Tetrahydrozoline Poisoning? Who should administer First Aid for Tetrahydrozoline Poisoning? 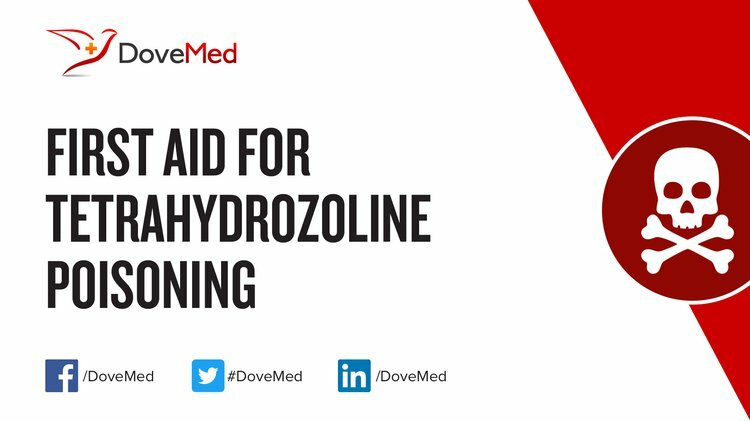 First aid for Tetrahydrozoline Poisoning is administered by healthcare professionals. What is the Prognosis of Tetrahydrozoline Poisoning? How can Tetrahydrozoline Poisoning be Prevented? Lasala, G. S., Vearrier, D., Boroughf, W. J., & Osterhoudt, K. C. (2014, August). Munchausen syndrome by proxy due to tetrahydrozoline poisoning. In Clinical Toxicology (Vol. 52, No. 7, pp. 746-746). 52 VANDERBILT AVE, NEW YORK, NY 10017 USA: INFORMA HEALTHCARE. Spiller, H. A., & Siewert, D. J. (2012). Drug‐Facilitated Sexual Assault Using Tetrahydrozoline. Journal of forensic sciences, 57(3), 835-838. Al-Abri, S. A., Yang, H. S., & Olson, K. R. (2014). Unintentional pediatric ophthalmic tetrahydrozoline ingestion: case files of the medical toxicology fellowship at the University of California, San Francisco. Journal of Medical Toxicology, 10(4), 388-391. Paksu, M. S., Paksu, S., Akkus, T., & Baysal, K. (2012). One drop can be beneficial, one swig can be deadly: tetrahydrozoline intoxication. The Turkish journal of pediatrics, 54(6), 658. Wahi, M. M., Stone, K. V., Chance, M., & Miller, C. E. (2017). Patient-Centered Medicine and Prevention of Munchausen Syndrome by Proxy. In Patient Centered Medicine. InTech. Rhyee, S. H., Traub, S. J., & Grayzel, J. (2013). General approach to drug poisoning in adults. Lowry, J. A., & Brown, J. T. (2014). Significance of the imidazoline receptors in toxicology. Clinical Toxicology, 52(5), 454-469. Tomassoni, A. J. (2016). Alpha-2 Adrenergic and Imidazoline Receptor Agonists: Clonidine, Dexmedetomidine, and Related Antihypertensives, Decongestants, and Sedatives.